What makes for a favorite character? How do you even pick a single favorite character from a cast that is most certainly into the many dozens, if not outright hundreds? By rights, this should have confounded me. I should have been at wit’s end for who knows how long, just trying to pick one, before finally picking one of the most unimaginative answers: Link or Zelda or something like that. Instead, as I sat back and thought, the answer came fairly quickly. And it might surprise you. It certainly surprised me. I know, strange, isn’t it? There’s so many colorful characters in the series, so many heroes and villains and friends, with such interesting personalities! How does Groose rise above the rest? Well, as varied as the overall cast of Zelda is, not many of them actually change over the course of the game. Most of them stay exactly the way they are when you first meet them. Not so with Groose. Not so. When we first meet Groose, it’s pretty clear that, in the small community of Skyloft, he is the bully. He’s big and loud, and cheats flagrantly, and does underhanded things to try and get what he wants. When he wants to impress Zelda by winning the Loftwing race, he actually kidnaps Link’s bird, your bird! Oh, it is clear that there are long-running hostilities between Groose and Link, not least of which is their rivalry over Zelda. Basically, Groose is not a very nice fellow, and not particularly bright either. Very surprising, then, when he comes crashing, or falling, back into the story later on, as an ally. Departing rather dramatically from the little world he knew, and into a much bigger one, Groose is shocked, to a hilarious degree, by pretty much everything. He manages to pull himself together, though, and insists on helping Link protect Zelda. As Link runs around saving the world, Groose becomes the man standing guard back at home base. As a great and terrible monster rises again and again to try and kill them all, Groose stands by Link’s side, using his wits and will to fight with more strength than he ever has before, and playing a pivotal role. When the enemy comes, he protects his friends no matter the harm that comes to him. Let’s take a moment to appreciate that. Here Groose is, alongside figures who will be legendary, nearly mythical, in ages to come. He’s right there with the original Princess Zelda, the original Link the Hero, and possibly the first Impa, standing against the King of Demons, Demise… and he holds his own. He helps. He’s just a normal guy! A large normal guy, perhaps, but, still a normal guy, far out of his element and out of his depth! And he holds the line. Without him, Link would not have won the day. Groose grows so much from this whole ordeal. He’s an infinitely better person by the end of the story, and he still provides some humor for us. For the life of me, I can’t think of another character in the entire series that has such depth, such growth, and such purpose within the story. You start out disliking him as a small adversary, but by the end, you can’t help but love him as your staunchest ally. 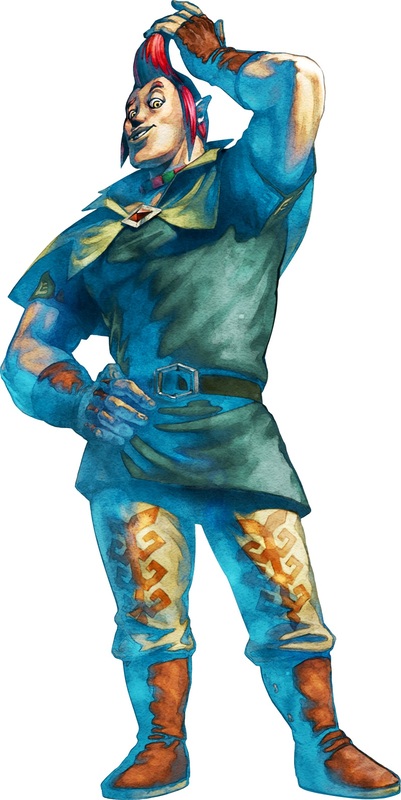 This entry was posted in 30-Day Zelda Challenge, Challenge Accepted, Games and tagged Groose, Legend of Zelda, Skyward Sword. Bookmark the permalink. Aside from Link and Zelda who I obviously love, a special shoutout has to go to Tingle, who’s consistency and style is unmatched.